ink and ink washes on paper, 40 x 32 inches. The thirteen artists featured in Line, Touch, Trace live and work in North Carolina. That is all they have in common, yet their drawings make for a satisfyingly coherent and visually appealing exhibition. Curated by Edie Carpenter, Director of Curatorial and Artistic Programs at GreenHill in Greensboro, NC, in consultation with Jennifer Dasal, Associate Curator of Contemporary Art at the North Carolina Museum of Art, Line, Touch, Trace is the first drawing exhibition presented in the museum’s North Carolina Gallery. The gallery is located just beyond the information desk at the entrance to the East Building. Materials used in the thirty-two drawings on display are as diverse as the artists themselves, ranging from age-old traditional to up-to-the-minute contemporary. John Hill Jr.’s droll fantasies are rendered in ink applied in dots and small squares to parody the four-color printing process of comic books; Matthew Micca’s topographic abstractions are color fields stained with ballpoint pens (Fig. 1); and Lori Esposito’s improbably symmetric plant forms hover on double-sided Mylar supports. With respect to style, the works represent an expansive concept of drawing that embraces Selena Beaudry’s loose, gestural Color Pencil Tracing #2 (2013) as well as the exquisitely wrought detail of the serpents in Ippy Patterson’s Escape from Eden (2003). In the many densely detailed drawings on display, obsessive repetition produces a wide variety of effects, among them the feathery, vibrant red fronds that couch the figures in Kreh Mellick’s Three Girls (2013) and the delicate, lacy transparency of the scrim that hangs on the surface of Kenn Kotara’s Making My Way(2011). Some of the subjects are drawn from sources as familiar as the Bible, while others are inscrutably personal. Joyce’s Calendar (1995) is one of hundreds of works in which Viennese-born Fritz Janschka examines his own penchant for graphic inventions through the filter of James Joyce’s literary imagination. (I know this because I have been married to him for 38 years.) Jason Watsonshows a predilection for popular American culture rather than highbrow Irish literature, assembling odd assortments of found objects into ensembles animated by strong tonal contrasts. Whether literary in inspiration or based on direct observation of visible reality, most of the drawings are original interpretations of venerable art-historical traditions. Patterson’s Escape from Eden unfolds in a hybridized format that reorients the Japanese handscroll and rethinks illustrated books in the western tradition. Mellick’s small drawings update the English Arts and Crafts approach to book illustration, whereas Kotara quite literally ramps up the size and scale of botanical illustrations. In hisCategory Two (2010) minuscule half-circles proliferate into aggregates of botanical motifs that at first glance resemble strings or spirals of algae seen under a microscope and on closer scrutiny the intricate floral designs in Japanese pattern books. Other artists in the exhibit ion tap into a rich history of architectural drawings. Isaac Payne and John Gall are as different as Giovanni Battista Piranesi and M. C. Escher, two of their predecessors in this regard. Payne integrates recognizable figures in spaces that are at once illusionistic and abstract – an effect created by framing images of three-dimensional urban structures with collaged paper. Since Payne’s settings consciously reference museum architecture, it is entirely fitting that The Steps (2010) is hung to mirror the perspective of visitors descending the central staircase of the East Building, where the exhibition is mounted. In contrast to the disquieting disconnect between the figures and their monumental setting in Payne’s Billboard (2013), the quirky, pot-bellied figures in John Gall’sThe Babel Makers (2003, Fig. 2) are humorously displaced in a tower of architectural facades, neatly arranged in chronological order. To their credit, Carpenter and the North Carolina Museum of Art designers made the most of the awkward, if prominent, space of the gallery designated since 2010 to work by North Carolina artists. They installed the exhibition in such a way that diagonal walls of different lengths are utilized to the artists’ advantage. Their groupings give space to the large works that need it and a more intimate viewing space to clusters of smaller works. In one instance Carpenter and her collaborators even capitalized on the proximity of a sculpture in the museum’s permanent collection, juxtaposing three of Beldue’s acrobatic silhouettes to the shadow cast by Bob Trotman’s suspended Vertigo (2010). The public opening was billed as a “meet the artists” event, and all were in attendance. Having traveled from across the state, they might well have expected a modest reception, but there was none. Line, Touch, Trace is on view until March 8, 2015, so for those who missed the opening, there is ample time to plan a visit. GreenHill is sponsoring a road trip on Saturday, October 4th, with talks by participating artists and a tour of the exhibition followed by lunch at Iris, the museum’s restaurant; for details see GreenHill’s website. Any additional programming will be posted on the North Carolina Museum of Art’s website. 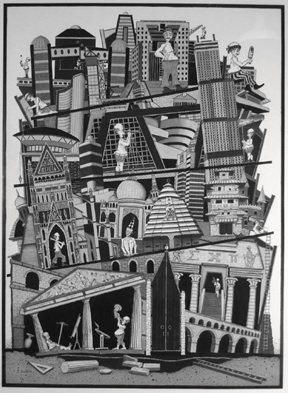 This entry was posted in Exhibit News, John Gall, The Art World and tagged Drawing, John Gall, North Carolina art, North Carolina Museum of Art on September 12, 2014 by Adam Cave. Diana Bloomfield doesn’t like working in a darkroom. For most photographers who started taking photos in the early 1980s, this might have been a career-ending problem. But for Bloomfield, a Reidsville native, that realization turned out to be career-defining. In Bloomfield’s garage-turned-studio behind her Saint Mary’s Street home, there’s no fancy digital camera, no collection of impressive long lenses, no spacious high-tech darkroom. Instead, the majority of Bloomfield’s work comes from the simplest type of photography equipment – a pinhole camera, most often one she has made herself. 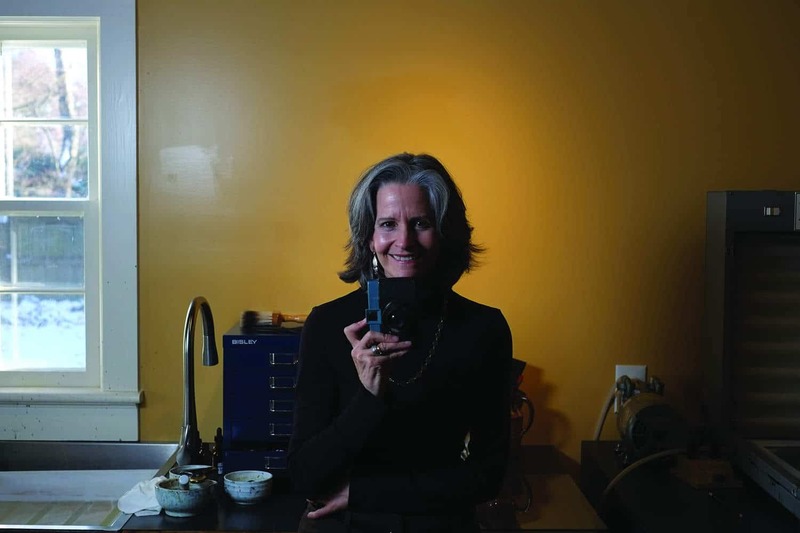 With this low-tech device – a light-proof box with film or photographic paper and a tiny pinhole instead of a lens – Bloomfield, 61, has made a name for herself. She’s racked up awards and fellowships, showed her work around the globe, and been published in photography magazines and books. But taking the pictures is just small part of her remarkable art. What really sets Bloomfield’s photos apart is the time-consuming and often tedious effort she puts into printing them, using old-world or alternative processes including cyanotype over platinum palladium; silver hand-tinted infrared; tri-color gum bichromate; and platinum palladium. These techniques give her photos an ethereal quality. Some look like they could have been printed 100 years ago. The result is unforgettable images, often so worked over that they don’t even resemble photographs. Bloomfield’s love of photography happened by chance. In 1980, she was leaving an administrative job at Princeton University, and at her going-away party, her then-boss gave her a 35-millimeter camera. She admits she was a little surprised and stumped by the gesture – and the camera – but she resolved to figure out how to use it, and enrolled in a photography class. Bloomfield quickly discovered that she not only liked photography, but she also had an eye for it. So she took another class, this time in large-format photography, a class that required some prerequisites that she didn’t have, since large-format cameras don’t have built-in light meters and sometimes require putting a hood over your head to get the right image. “The teachers just said, ‘Here’s the camera, here’s the film.’ I struggled through, it but I figured it out,” Bloomfield said. Figuring it out, she admits, meant walking around Trenton, N.J., photographing people while simultaneously teaching herself about light, exposure and composition. It was worth the struggle. She ended up winning a photography fellowship from the New Jersey State Council of the Arts based on the documentary photos of people who worked in Trenton. That then-boss who gave her the camera – Peter Bloomfield – six years later became her husband. She asked him years afterward why he’d given her the camera. “He said, ‘Because you always said you wanted to take pictures,’ but I don’t ever remember saying that,” she said. After the couple married, they moved to North Carolina, when Peter Bloomfield took at job at the statistics department at N.C. State University. Diana Bloomfield, however, felt a little lost after the move. She missed her close-knit photography community from New Jersey. She decided to go back to school, this time taking English classes at State, and eventually earning a master’s degree in creative writing and literature, another craft that she said came easily. In 1992, the family, which now included a daughter, Annalee, moved to New York City for a sabbatical. And it was here that Diana Bloomfield picked up her camera again using a twin-lens reflex camera to create two-inch square negatives of the vivid scenes of the city, from Central Park bridges to Coney Island amusement rides. Back in North Carolina, she kept at it, continuing to take classes and exploring different ways to manipulate photos to create dream-like images, which is how she says she sees the world. “I wanted to photograph in more of a dreamy way rather than being so literal,” she said. The N.C. State Fair with its rides, carnies and many colorful lights was an ideal place to chase that dreamy imagine, she said. She also began experimenting with infrared film and started hand-tinting her photos. About the same time, digital cameras started taking over. She was teaching a photography class at the N.C. State Crafts Center, and more students were coming in with complicated digital cameras, and she was dedicating more time showing students which buttons to push rather than the art of photography. “I thought, ‘I’m not having fun, and I know they can’t be,’ ” she said. Then she had the idea to bring into class the simple pinhole camera to help them understand the mechanics of taking a photo. “Looking into a pinhole is a great way to teach people how it works,” she said. With a pinhole camera, light passes through the pinhole and projects the image upside down on film on the other side of the box. Plus, it gave her more of that dreamlike quality she was chasing. “It seemed to do what I wanted to do with my images,” she said. 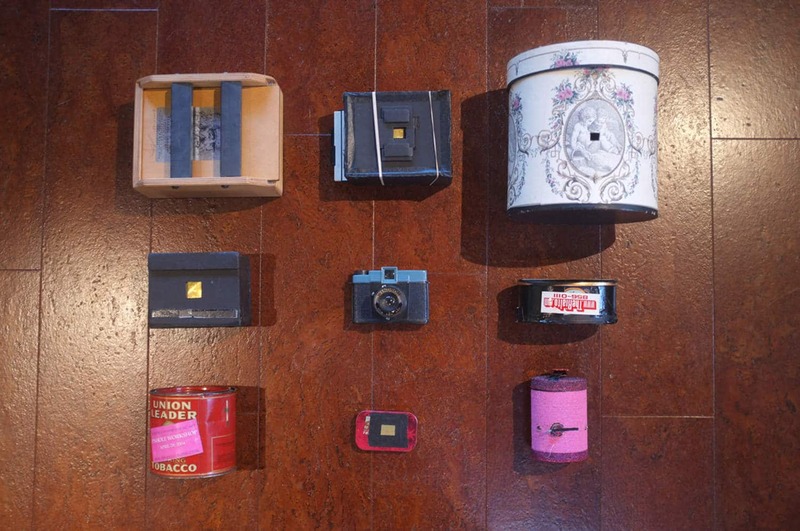 Her journey with pinhole cameras took her in new directions with her work. She discovered platinum printing and other 19th-century printing processes. She found they kept her out of the darkroom, which she already knew she didn’t like. Today, Bloomfield continues to explore these processes, which begin with a large digital negative or in some cases, the original. Then she mixes an emulsion and brushes it on watercolor paper. Next, she develops the image. Then she layers on another negative, painstakingly re-registering it so it’s lined up and repeats the process. “You keep doing it until you get this full, rich image,” she said. 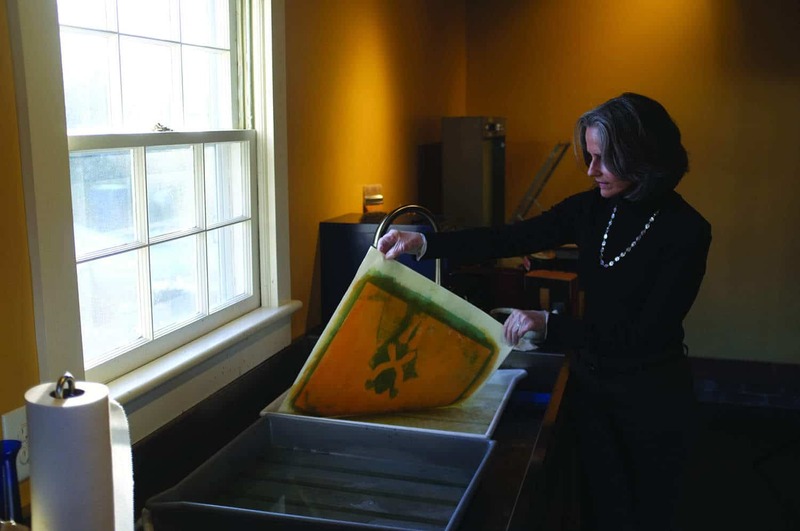 Since the processes she works with are exposed with UV light, such as the sun or a UV light box, “no traditional darkroom is necessary,” she said. Her muse over the years has been her daughter, who is now grown and living in New York City. Through Bloomfield’s lens, you can see Annalee at the beach, on a swing at Crabtree Creek, near Thomas Sayre’s rings at the N.C. Museum of Art, inside the listening vessels at N.C. State. Their mother-daughter connection is so strong through photography, Bloomfield says they go out to work and they never even have to speak. Annalee instinctively knows how to move to give her mother the shot she needs. The result is invaluable collection of gallery-quality photos of her daughter. Some of her other noted pieces include photos of the marsh and beach at Bald Head Island, landscapes from a trip out west, North Carolina’s kudzu fields, the midway at the N.C. State Fair and Raleigh’s Rose Garden. Her photos range in price from $250 to $2,100, depending on size, at Adam Cave Fine Art. You also can see her photos in collections at N.C. State’s Gregg Museum, Ravenscroft School, the City of Raleigh Museum, the Bald Head Island Club and the N.C. Department of Agriculture. One of her biggest collections of photos is at Credit Suisse, which bought 44 pieces eight years ago for its Research Triangle Park offices. She also has work in the Pinhole Resource Collection in New Mexico, one of the world’s largest collections of pinhole camera images, which was recently acquired by the New Mexico History Museum. Bloomfield also teaches workshops from her studio, an enviable remodeled space tucked behind her home. From the front, it’s just another backyard garage in Hayes Barton. For years, it was filled to capacity with the family’s old treasures. But three years ago, she asked home builder and renovator Greg Paul to turn it into a workable space. The result is a rustic yet modern two-room studio with an exposed ceiling and a barn door separating the two rooms made from the garage’s old heart-pine floors. In here, she’s able to labor over her photos without ever having to step into a darkroom. This entry was posted in Gallery Artists on July 25, 2014 by Adam Cave. A pair of four-eyed beauties in Japanese robes float across blue sky on the backs of two white cranes in flight. It’s a stylized painting, surreal, like something seen in a dream. On another wall, there’s a black-capped chickadee on a painted abstract perch, so lifelike it looks ready to chirp and fly away. Two artists offer their vision of birds at this month’s First Friday event at Adam Cave Fine Art downtown. Raleigh-based Tisha Weddington paints symbolic canvases of birds and women designed to be interpreted by the viewer. Byron Gin’s birds are so detailed they look like photographs, set against playful splashes of abstract color. In Weddington’s art, animals are often used to bring masculine energy to her paintings, Cave said, which often center around a female figure. Her birds can also serve that purpose, but just as often they are light, flitting or perched gently on an outstretched hand. “I love for people to come up with their own stories, to narrate my images as they wish,” Weddington said. Weddington is inspired by Japanese prints, bullfighting posters, old circus prints. She doesn’t have her own stories for the paintings. She works intuitively, with layers of drawing and paint. Gin, who is based in Chicago, has degrees in both art and environmental science and says he gathers inspiration from day-to-day life – like the birds on his backyard feeder. Viewers have a strong response to paintings that incorporate birds, Cave said. There’s precedent for that in art history. From Renaissance art to the peace movement, doves and other birds have strong symbolic meaning. There’s also a spiritual element – the Bible features doves, ravens and other birds playing key roles in important events from the Great Flood to the blessing of Jesus. In Native American tradition, an eagle or other bird can serve as one’s spirit animal. Plus there’s the frenetic energy associated with birds that brings a sense of movement to any painting, Cave said. After a bitter winter, spring has graced the Triangle, which means daffodils, forsythia and new art in Raleigh’s galleries. Before the blossoms and fresh air lure you out into the sun, take in some of the beautiful, obsessive artwork currently on display. Adam Cave Fine Art is showing a pair of image-makers, Diana Bloomfield and Donald Furst, whose processes inform their works with mysterious qualities that will move you to want to become an initiate. Diana Bloomfield’s pinhole and alternative-process photography endows her subjects with a hyperrealism. Many of the images are the result of a multicolor gum bichromate process that dates to the 1850s and produces a unique print. This process—which can take days—is similar to offset printing. She brushes an emulsion containing watercolor pigment onto paper, exposes it with a separation negative, develops it and then does it again, layering a different color. Bloomfield reveals this process in a stunning quartet of portraits of pinned moths and flies. The insects appear neatly within a white square, around which Bloomfield’s emulsion brushstrokes are left visible. This chaotic rainbow perimeter plays foil to the calm images of the perfectly spread luna moth and damselfly, transforming them into kept secrets. A slight imprecision in registration of the colors lends an animate blur to the nocturnal moth, which must vibrate its wings to heat up its flight muscles in the absence of radiant sunlight. Bloomfield also uses a complicated “platinum over pigment” process, which is explained on a lengthy gallery sheet. But the technical information isn’t necessary to admire the work. It’s her compositional eye in “Winter Kudzu” that recognizes a fascinating undulation in the leafless mesh of vines on bare trees. The platinum gives a radiant Polaroid darkness to the print, which plays up the threatening nature of the viral, ubiquitous plant. Donald Furst’s engravings and lithography glow with dreamlike potential but resist surrealism. The perspective of his interiors is located in a darkened room that includes an open door to a lighted hallway. Or the image vanishes into a darkening passageway that dimly reveals a corner at its depth. Every doorway permits a swath of light in, which allows Furst to show his virtuosic skill at achieving gradations of gray. Neither claustrophobic nor creepy, these empty rooms and disappearing corridors are more like being locked in an M.C. Escher office building overnight than stuck in a cyclical David Lynch set. Upon scrutiny, an elaborate mirror trick is perceptible in “Echolalia,” giving the sense of infinite iteration. But in a vitreograph titled “Strive? II,” steps terminate in blind walls, and suspended disintegrating ladders lead nowhere. The meditative precision of Furst’s process becomes slightly anxious in several miniature mezzotints only a couple of inches wide. Currently the chair of the departments of art and art history at UNC-Wilmington, where he has taught since 1985, Furst possesses an astounding intaglio repertoire. His 13 images include woodcuts, mezzotints, lithographs and etchings. The woodcut “Higher Than” merits a visit all by itself. Put your nose an inch from its surface and scrutinize the detail in an area of treetops from which hewn ladders protrude. Then pick your lower jaw up from the floor. Here at the beginning of a new century, one of the most important art forms of the last millennium is also one of the most misunderstood. Printmaking, despite its long history, confuses modern collectors more than any other medium. The complexity and variety of fine art printing techniques, combined with the advances in reproduction and commercial printing, have all contributed to this confusion. However, with some clear explanations and a little history, art collectors should have the tools to understand the prints that they see and more fully appreciate this fascinating art form. The word “print” these days can refer to anything printed in any manner; however, most fine art printmakers make works defined as original prints. The term “original” indicates that the artwork was conceived, from the start, to be a print. It is not a reproduction of a previously created artwork such as a painting. “Original” also reflects the fact that hand-made prints, although often multiples of a single image, are made one at a time, and no two are exactly the same. By contrast, reproduction prints are mechanically made copies in which a scan or photograph of any type of completed artwork is used by computers and commercial printing presses to produce facsimiles. Examples include limited-edition gicl�es, offset lithographs and posters. Printing dates back over 1000 years to early Asian block prints, but fine art printmaking as we know it did not fully develop until the invention of the printing press in 1440. The press allowed artists to spend more time refining images and printing them with much greater consistency. Woodcuts and engravings by Albrecht Durer in the 16th century were some of the first works to demonstrate printmaking’s potential. In the 17th century, Rembrandt became as famous for his emotionally charged etchings as his paintings. This period also saw the growth of a new, educated middle class that wanted to collect art. Only royalty and the church could afford large paintings, but prints, by the very same artists, were affordable and highly collected. Increasingly, many now-famous artists subsidized their careers with print sales; Goya (18th century); Manet and Degas (19th century); Picasso, Dali, Wood, Benton, Hopper and Warhol (20th century). The good news for collectors is that while paintings by these artists are all but priceless, their original prints (and those of countless others) are far more affordable and are actively collected and enjoyed. An original print is most often an image created with ink on paper where the ink has been transferred to the paper from another surface instead of drawn directly by hand. An artist inscribes marks on a primary surface called a matrix (a metal plate for example). These marks hold ink and, with pressure, can transfer, or “print” that ink onto a piece of paper. The resulting print is a mirror image of the matrix. Most of us have done rudimentary printmaking when we made potato stamps in elementary school. Stamping, woodblock printing, linoleum block printing, and wood engraving are examples of one of the three major categories of printmaking: relief printing. To make a relief print, an artist uses knives and chisels to carve patterns into a flat, smooth surface such as a block of wood. Ink is rolled on the uncarved surface and then paper is pressed down on the block with enough pressure to transfer the ink to the paper. Since no ink touched the carved out areas (below the surface) they form the negative space in the image and appear white in the resulting print. Artists who prefer their carved marks to print black instead of white choose intaglio printmaking, which includes engraving, dry point, mezzotint, and etching. In the first three techniques the artist uses sharp tools to scratch directly into a metal plate, usually copper or zinc. Ink is rolled on the plate and pushed into all the scratched grooves below the plate surface. The smooth surface of the plate is subsequently wiped clean leaving ink only in the grooves. 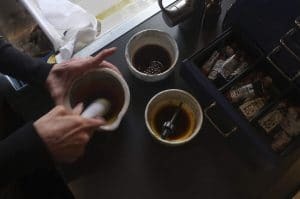 The artist covers the plate with a dampened sheet of paper and puts both under a press, the pressure of which pushes the ink out of the grooves and onto the paper to create the print. Since scratching delicate marks directly into metal is difficult, etching was developed, and is the most widely practiced intaglio technique. In etching, the metal plate is first covered with a thin layer of clay-like substance called a ground. With a stylus, the artist can easily and fluidly draw in the ground, exposing the underlying metal with each mark. The plate is then put into a bath of acid that etches grooves into the exposed areas of the metal. After taking the plate out of the acid bath, the ground is removed, and the plate is inked, wiped and printed using the same methods of the other intaglio processes. The third type of original printmaking is planographic and includes lithography and silkscreen printing. Planographic techniques create images on the surface of a matrix without any carving or etching. Lithography is based on the principle that oil and water don’t mix. The matrix is traditionally smooth limestone on which the artist draws with a greasy crayon. These marks are then chemically treated to attract oil and repel water. The stone is dampened with water and when ink is rolled on the surface it only sticks to the treated areas. The inked stone is covered with a sheet of paper and sent through a printing press to print the image. In silkscreen printing, an invention in the early 20th century, the artist designs a stencil that is glued down on a fine screen. The screen is laid over a piece of paper and ink is forced through it. Since the ink can only get through the areas not covered by the stencil, the resulting image corresponds to the stencil design. There are far too many types of original printmaking to mention in this article. However, almost all techniques fall under relief, intaglio or planographic printmaking and most allow for the repeated printing of an image multiple times. The resulting set of images is called an edition and each individual piece is a proof. Although no two hand- made prints are ever exactly the same, great consistency between the proofs in an edition is a sign of a printmaker’s skill. Some artists have no interest in creating editions at all and instead make singular prints called monotypes that cannot be repeated. Modern printmakers who do create editions will pencil sign and number each piece so that collectors know how many have been made. Printmaking today does seem to be enjoying a renaissance, and collectors who understand the medium are in for an exciting time. Artists have more access than ever to the tools they need and they are creating deeply personal works in an endless variety of styles and techniques. Just as in earlier centuries, high quality printmaking by well-known artists continues to be affordable and can be a very wise investment. Collect today’s contemporary printmakers and you may well be buying tomorrow’s Rembrandts. This entry was posted in The Art World on July 19, 2014 by Adam Cave.